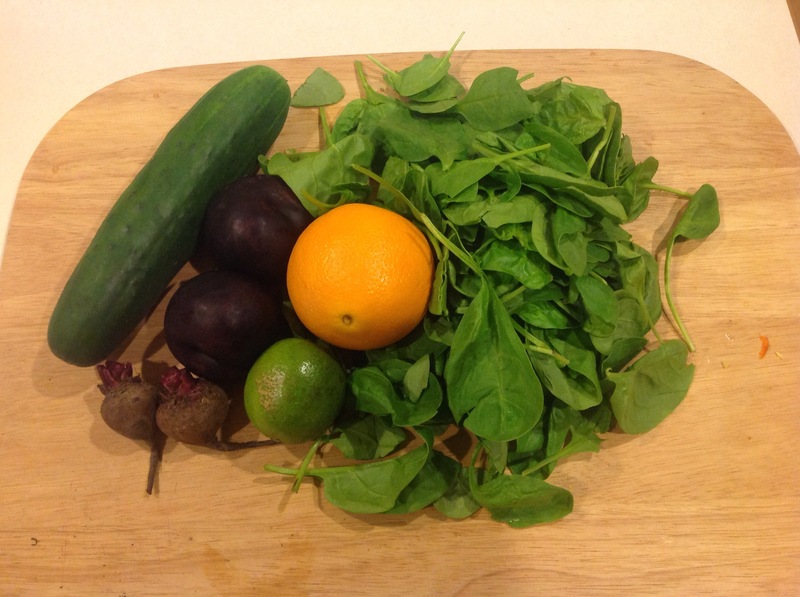 This was my juice for Thursday, I only made one juice because Carl wanted coffee and I was in a different office. I had to use up a few ingredients as well. 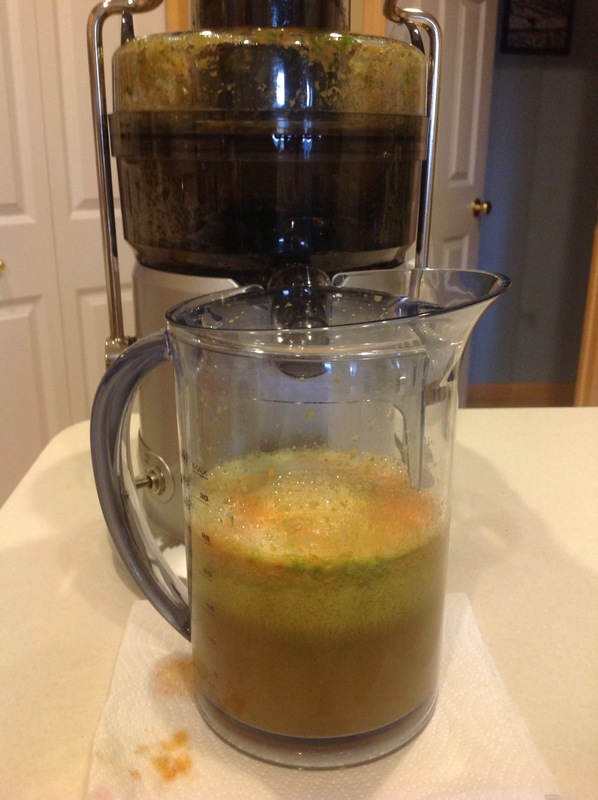 Finished Juice. 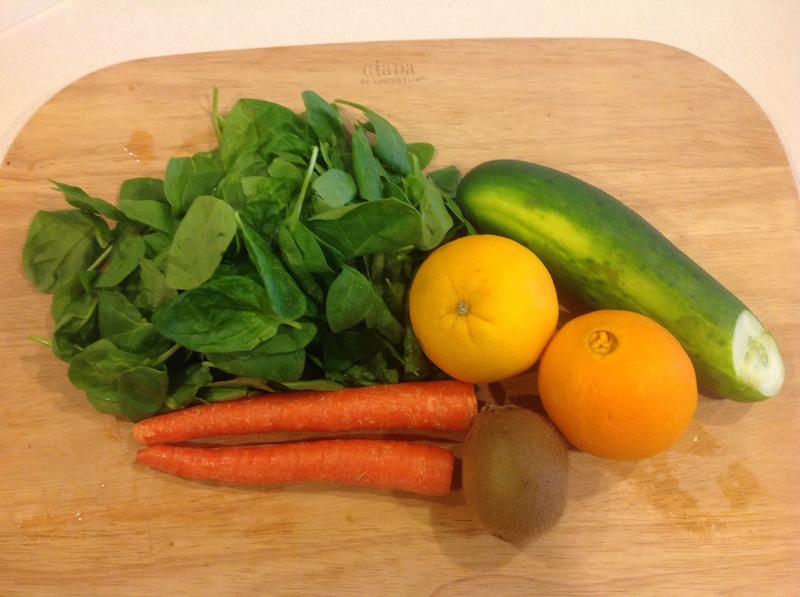 This was a good juice even though I drank it for both morning and lunch. 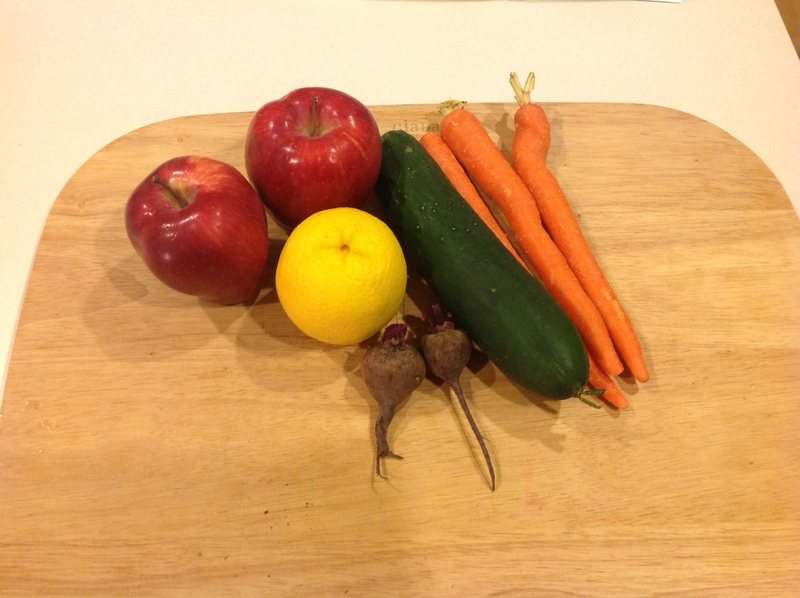 These were our juices from Wednesday. Sorry I was slacking at my blog posts during the week. 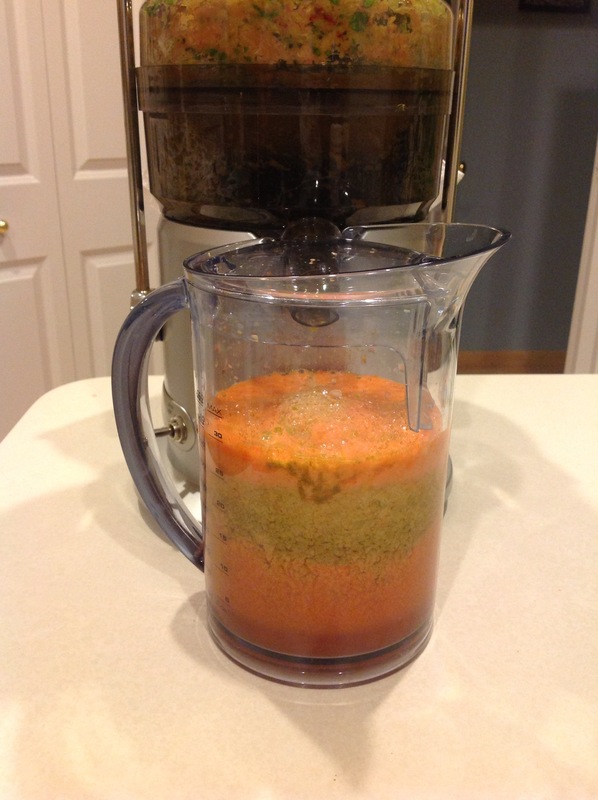 Finished Juice. 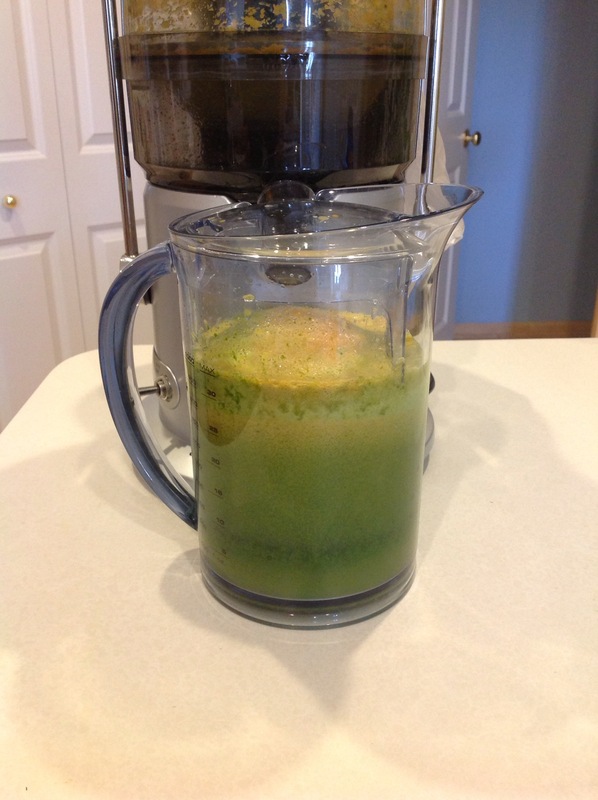 This was a great morning juice. 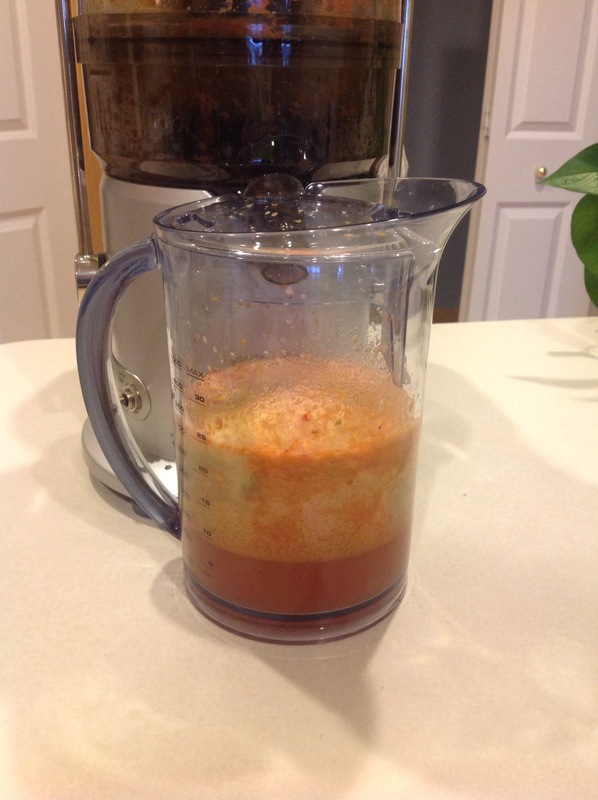 Finished juice. I liked this juice. 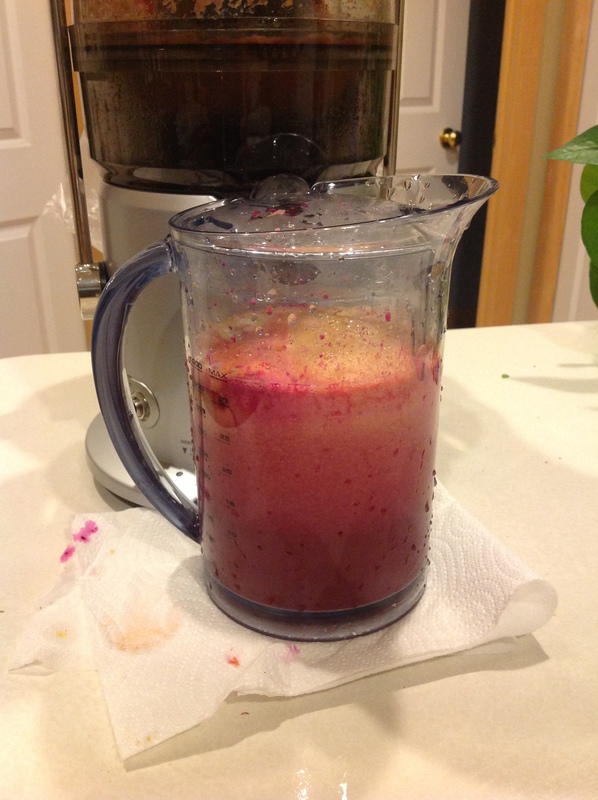 I am getting to like beets more if they juiced. 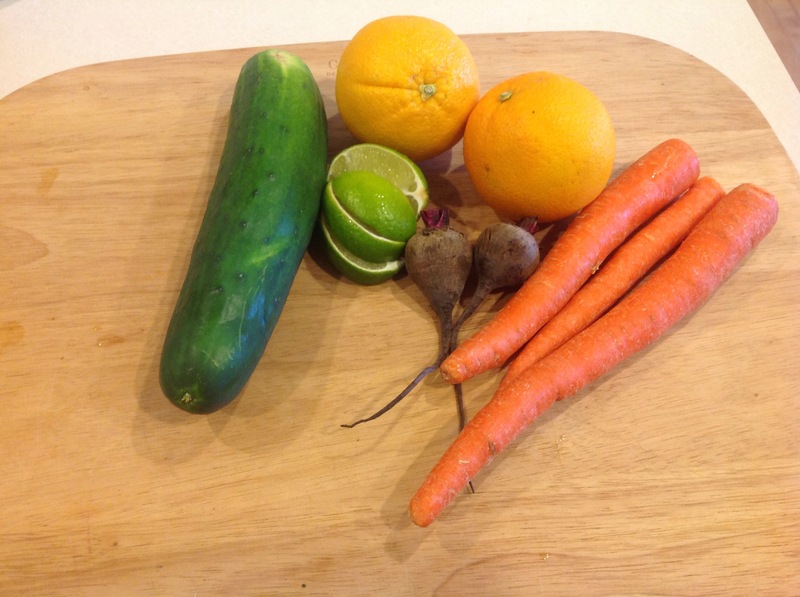 The lime adds a great kick to the juice. 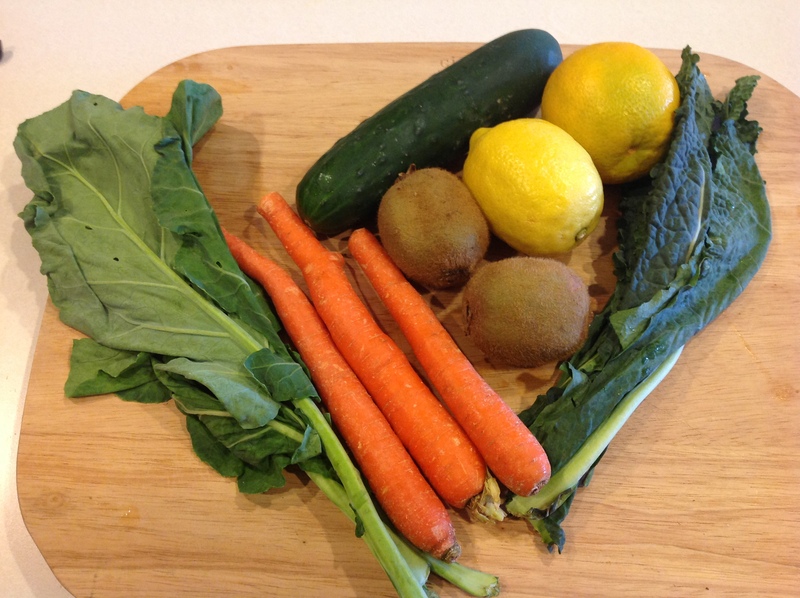 These are our Tuesday Juices. 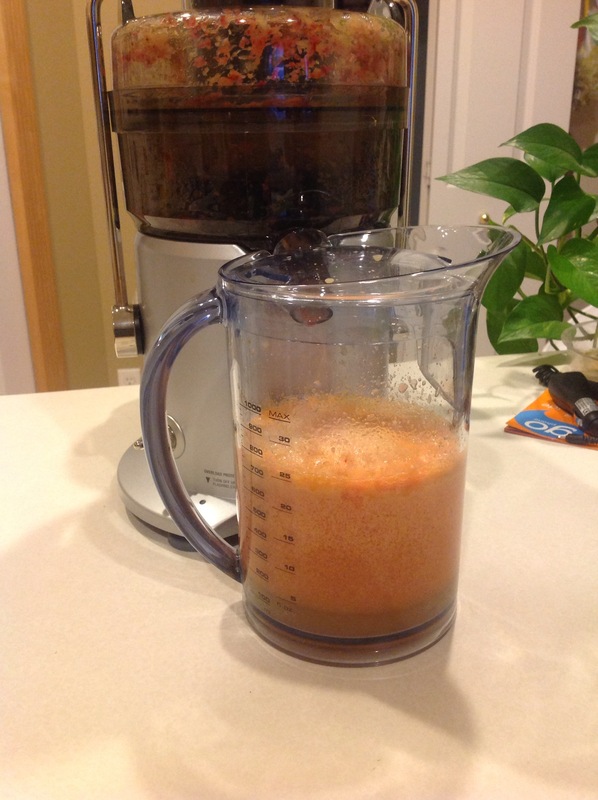 Finished Juice. I liked this one with the peaches. Yum. 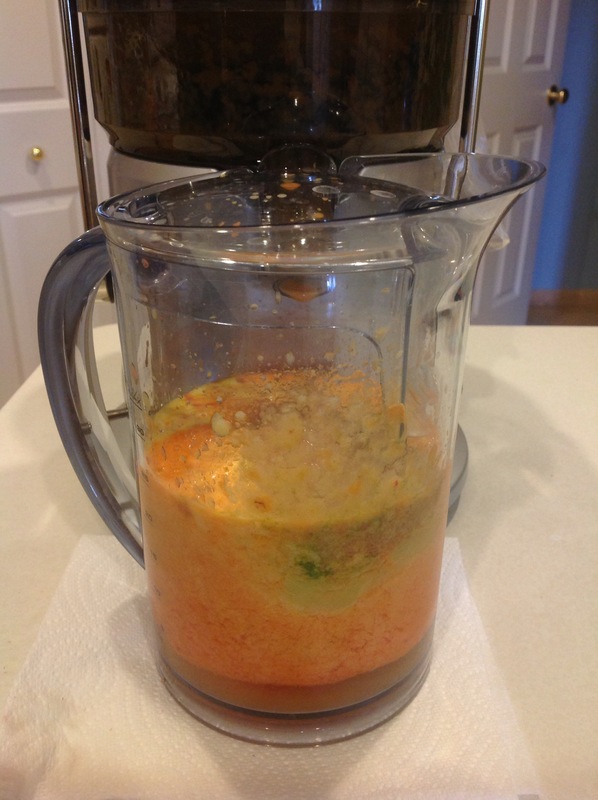 Finished Juice. This was a good refreshing juice for the afternoon. This was our typical weekend of running errands. I seriously feel we are always running errands. I must say with a Costco membership, we don’t run nearly as much. 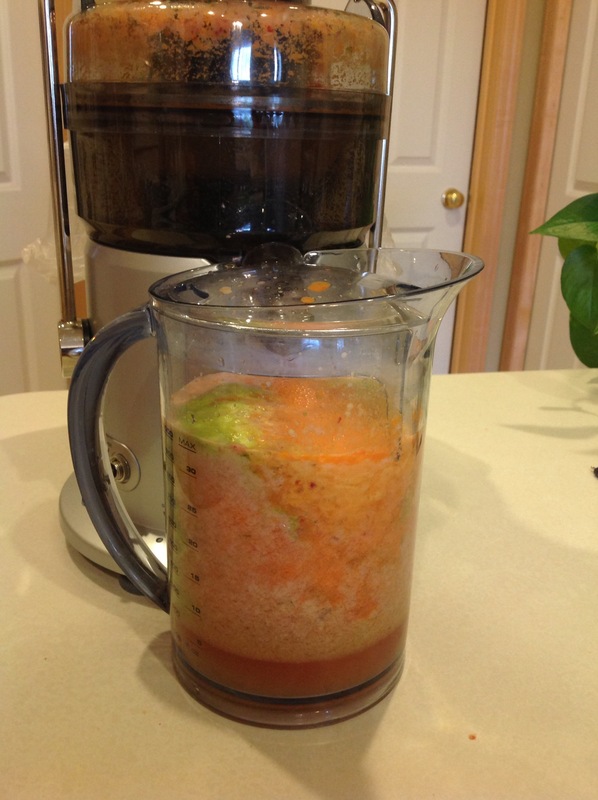 We have it down to a science that we can get through about 2 weeks with our fresh fruits and veggies for juicing. 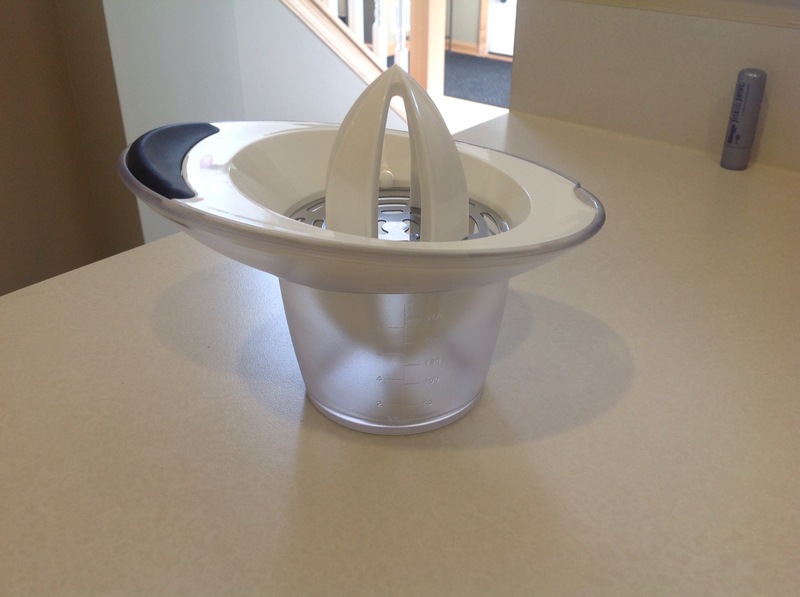 Which is helpful with budgeting and space for food- we don’t want to be wasteful. On Thursday night, I decided I wanted to move my spices from the cupboard where they were messy and I couldn’t see what I all had, to one of my kitchen drawers. We cook a lot more and I have more spices that this seemed like a good idea. 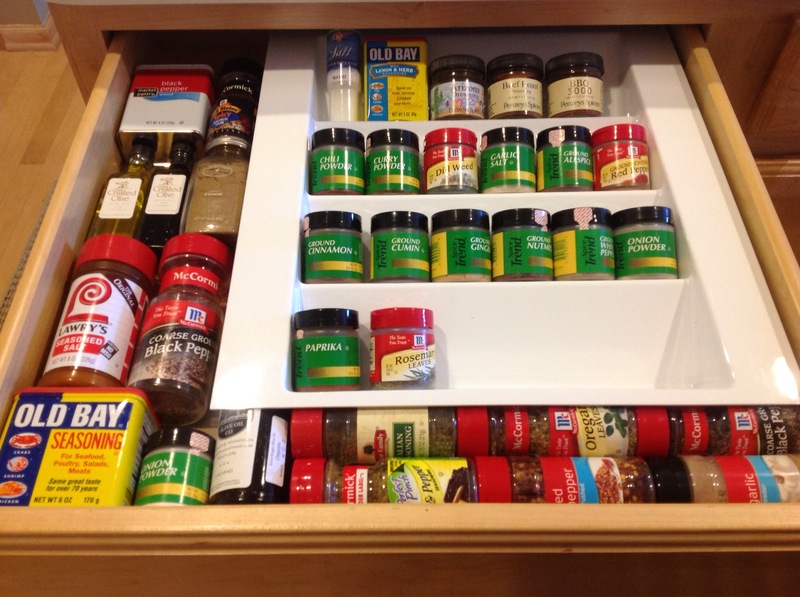 I spent Thursday night and some on Friday, searching on the internet and calling places to look for a “spice drawer” insert. I found beautiful wood ones that ranged from $30.00 to over $100.00, I was not looking to spend that much. I then found an plastic insert at Home Depot that I could cut down to fit in my drawer specifically. I really like my drawer and wish I would have done this sooner. 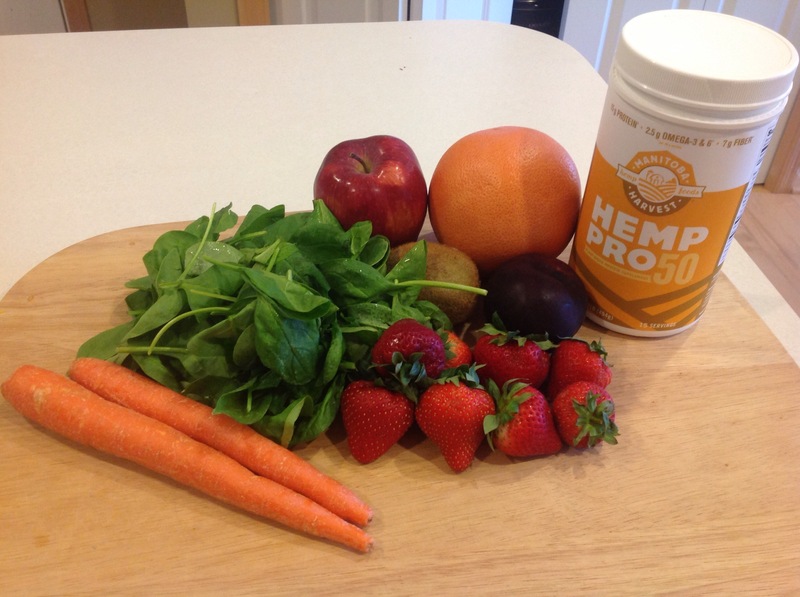 On Friday after work we ran to the Coop because I have been doing research on Hemp Protein. 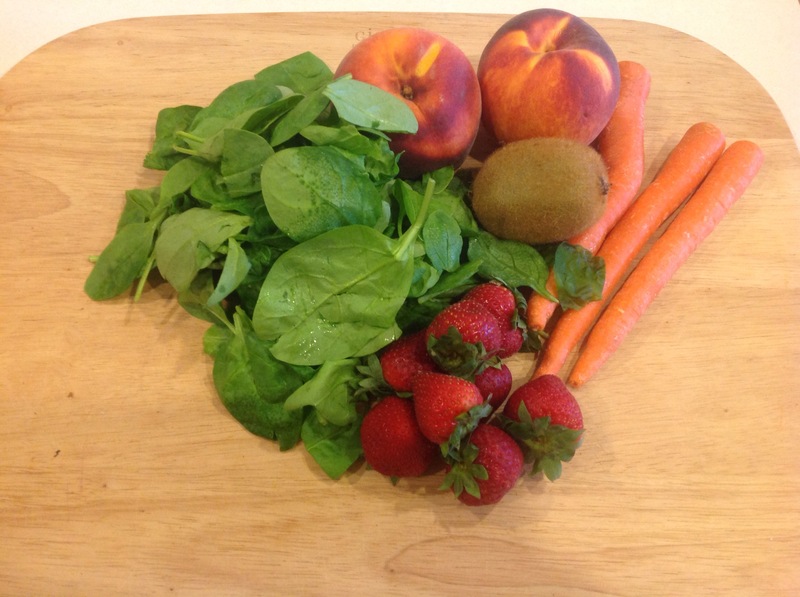 I am going to try this protein with my juices and future smoothies when I make those. 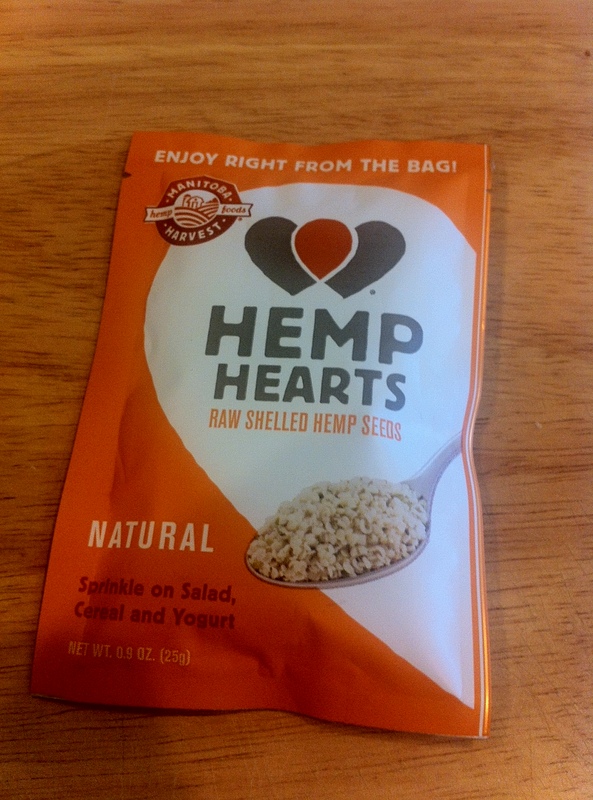 lol I also bought a sample pack of Hemp Hearts which is similar to flax seed or chia seeds. Manitoba Harvest is the brand they had at the Coop. I wanted to get the Hemp oil, they were sold out of that. 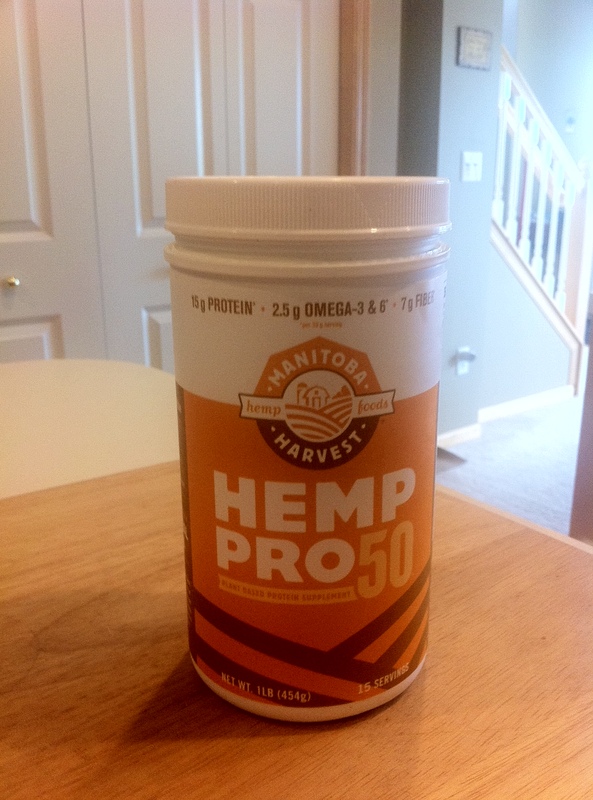 I got the Hemp Pro 50 and Hemp Hearts, I will let you know more of what I think when I try them this week. My mom has been helping me research more holistic ways to assist with my aches and pains and immune system. We have been looking at the oils, so at the Coop I got the wintergreen organic oil. I will update you on that once I try that. On Saturday morning, we had to go to Target to get a new toaster, my 4 slice toaster kicked the bucket this week, I was bummed as we liked the toaster. (side note- Arie woke us up at 5:47am)While at target we had a couple other odds and ends to get. We have friends coming this weekend Fri, Sat and Sun and we are doing chicken and steak kabobs with sweet corn and some other veggie. I need to get MORE spices for the steak marinade. 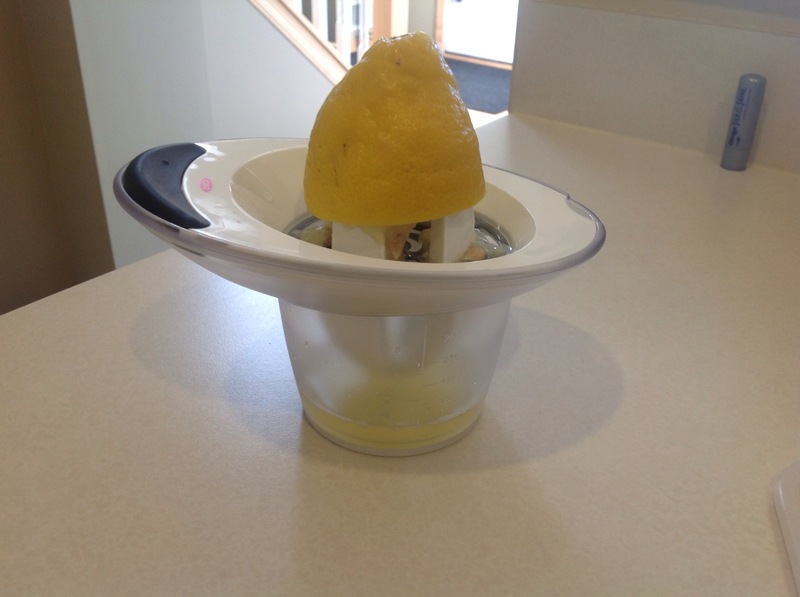 While at Target, I have been looking for a bigger citrus juicer, I have one small handled one but want a bigger one because it does not fit my Costco lemons very well, it makes a mess and the seeds go every where. So I found a nice citrus juicer at Target and I love it! 🙂 Great find! On Friday, I ran to the grocery store by work to browse, I needed to get out of the office. I grabbed a few spices and then I saw this Beer Can Chicken Rub that was already made and thought it would taste great. 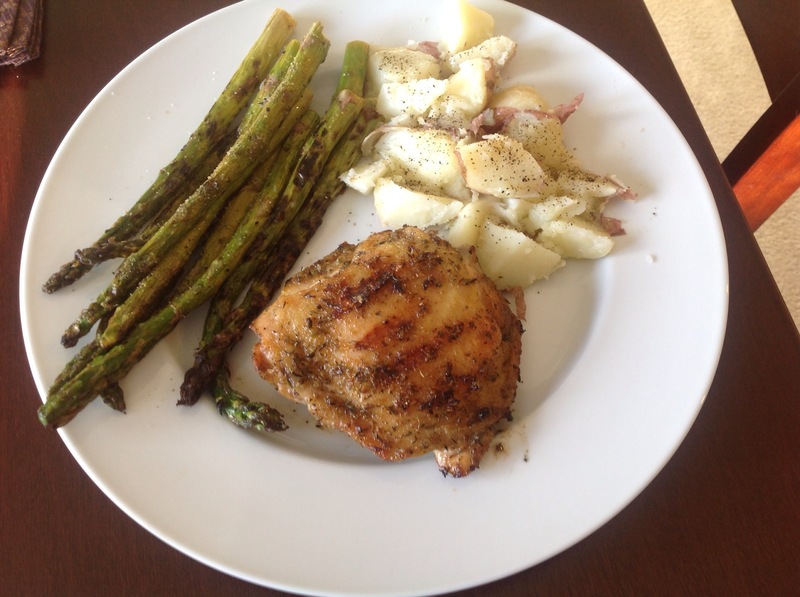 So on Saturday night, Carl and I made chicken thighs with the rub, steamed baby red potatoes and asparagus that was soaked in olive oil, fresh lemon juice (from my new citrus juicer) and salt and pepper on the grill. The chicken turned out fantastic with the rub, I tried finding it online for y’all but I can’t. 😦 It does have Dean Jacobs on the top of the tin. So when I googled that, I got excited because this company has a whole website of fun goodies for cooking! I think I might purchase some of the olive oils like the basil and rosemary infused ones. Yum! 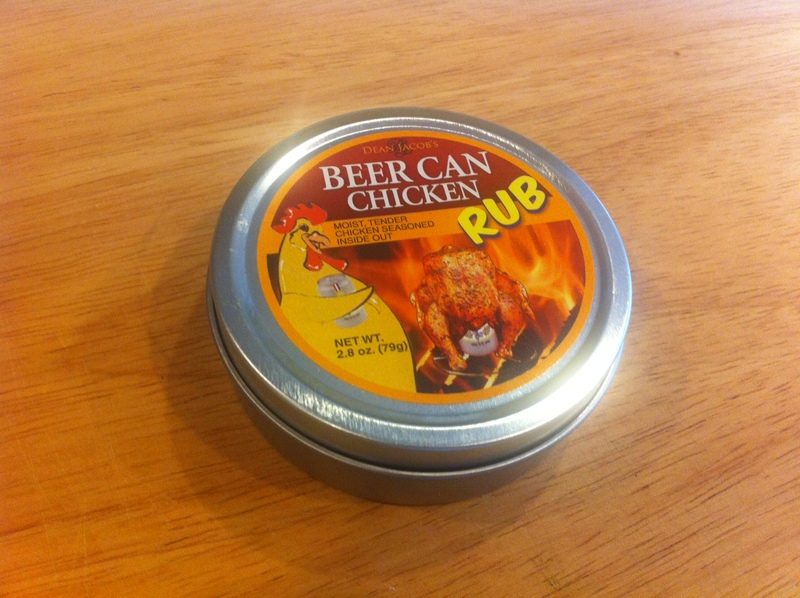 I re-googled the rub again and at least found a picture, even though it is amazon- Dean Jacobs Beer Can Chicken Rub. I just wanted to share some of our fun kitchen finds this past week/end. I will have a few more fun blog posts coming up as I have a few things up my sleeve. I am looking into what is going to be be my fall/winter hobby! I’ve got it and it’s going to be a real honey! 🙂 Another side note- Arie had me up Sunday morning at 4:11am and then again at 6:13am, needless to say, I was up and ready to go for the day! So Juice #34 and #35 were our Thursday Juices and Juice #36 and #37 were our juices for Friday. 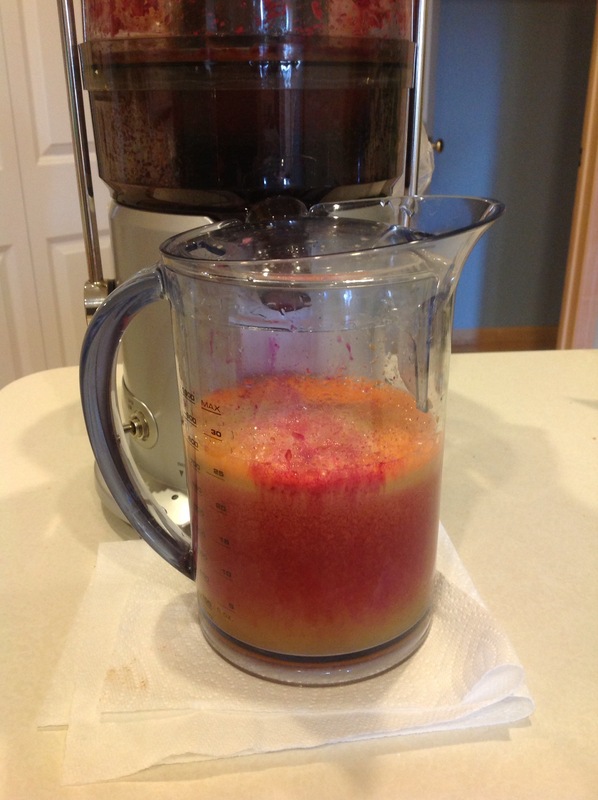 I did not take pictures of Friday juices as there were extremely similar to Thursday, I was using up my ingredients so I had room in the refrigerator for our Costco goodies. 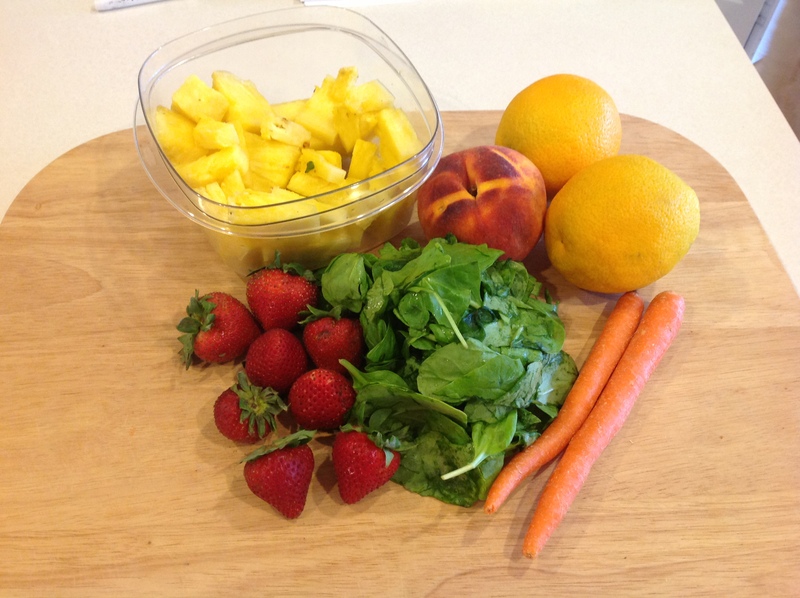 We enjoyed this juice, it was refreshing and it is a great way to use up ingredients. This juice was very tart. I am guessing it is from the lemon. Carl described it as “stemy” that was from the collard greens and the kale. I wish I would have added blended banana, that would have tasted good I think. Juices #36 and #37 were pretty much the same the quantity was a little off. 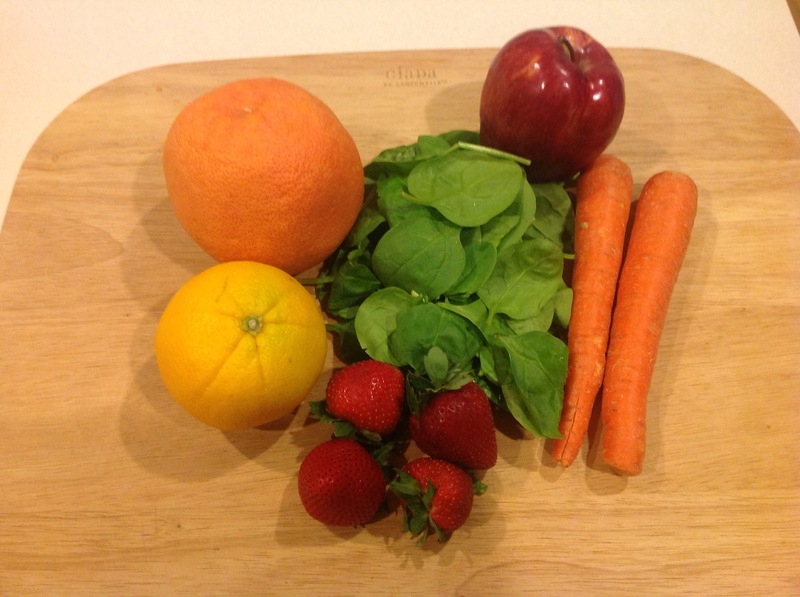 This week I decided to go a little bold this week and I have a few juices that are similar as I have to use up my fruit and veggies before we go back to Costco this weekend. I got BEETS! yes beets. 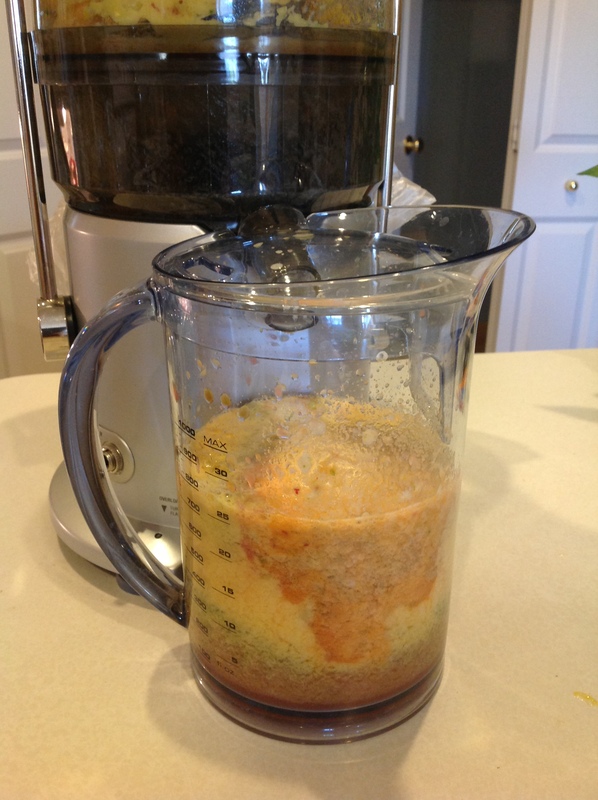 I can’t stand beets in the flesh and whole, so I figured maybe I would tolerate them if their were juiced. I made my list for Costco and we have quite list going. We also have to get a new toaster because our is broke. 😦 I am going to look into holistic oils and protein and report back to you all. 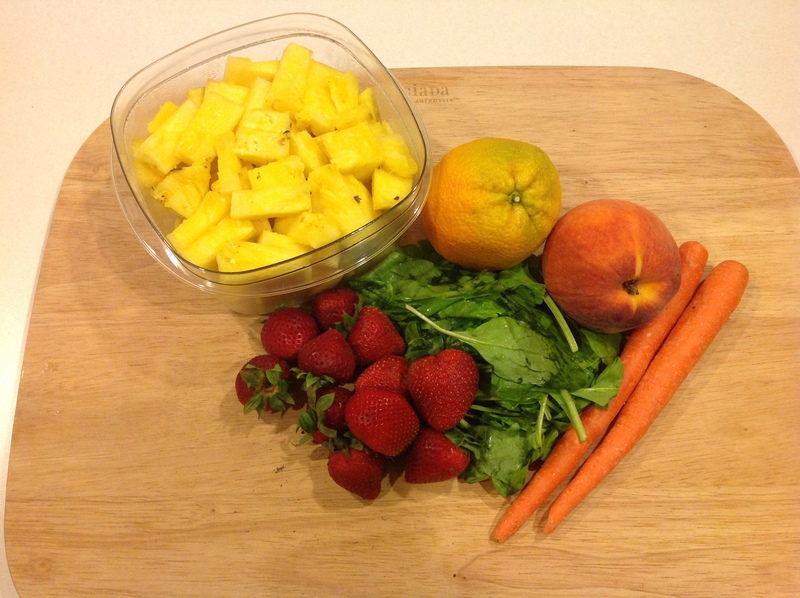 This was a good morning juice, I liked the taste of the pineapple. 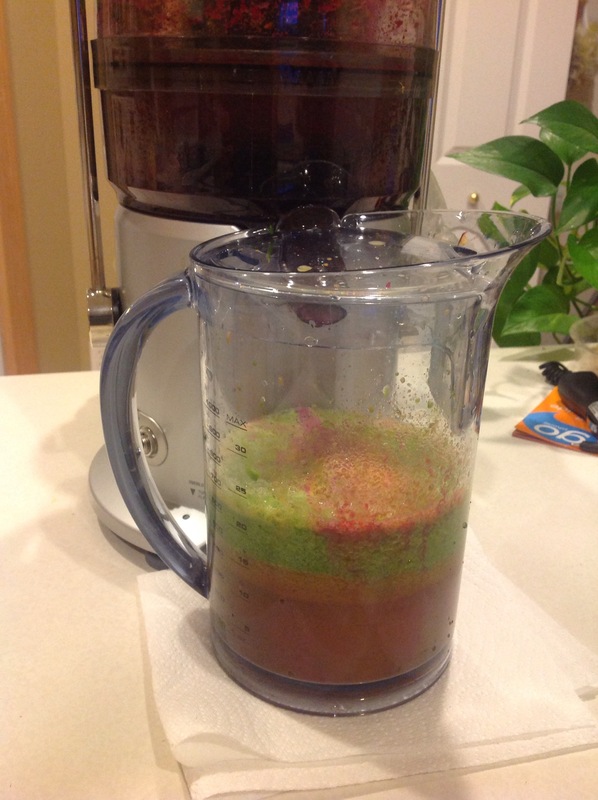 I added a few sprinkles of ginger and squeezes of lemon juice. I was pleasantly surprised with this juice. I did not mind the beets. It did taste a little earthy and like dirt, but I got past that. So we have this beautiful pineapple on the countertop and decided to cut that up for juices this week and finish up our fruit and veggies before we go on our bi-weekly trip to Costco. This juice was good this morning. 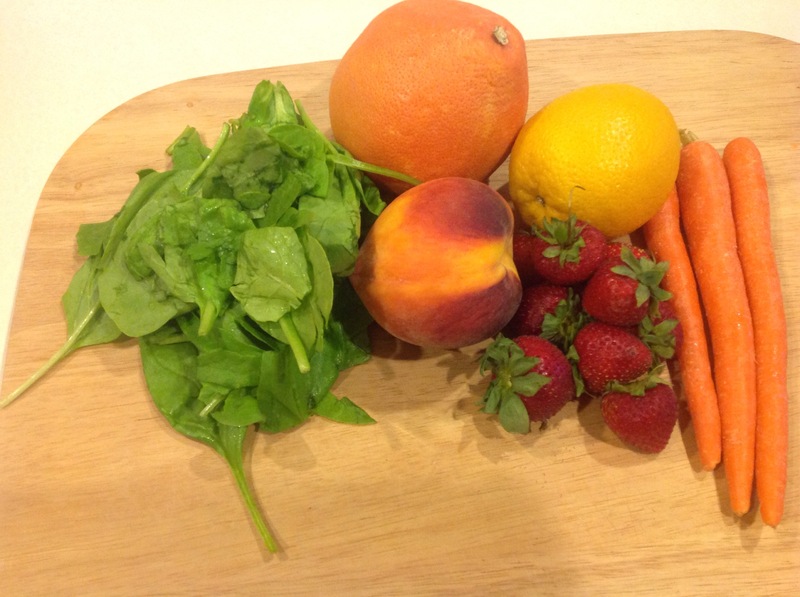 I had a juice that my friend gave me to try for lunch today. I also had a yummy lettuce wrap for lunch. 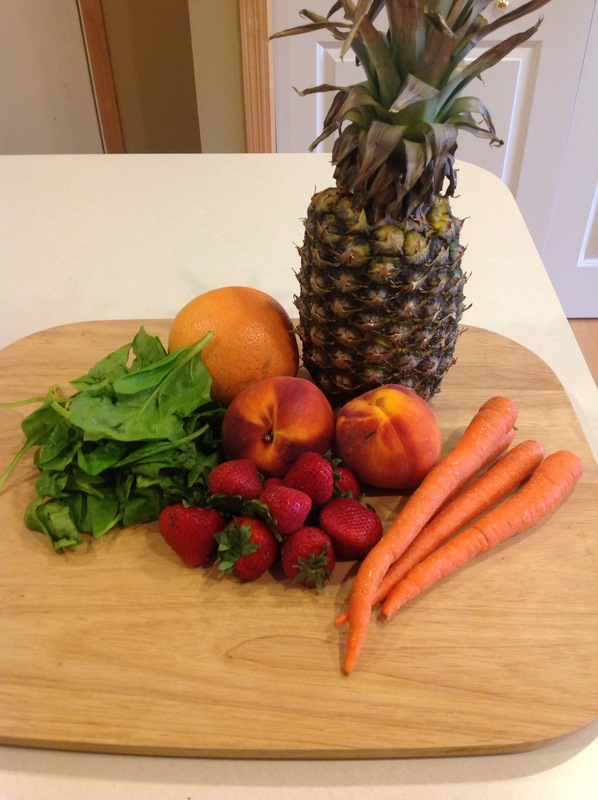 We had this juice for breakfast and it was a good mixture of pineapple and the other fruit. 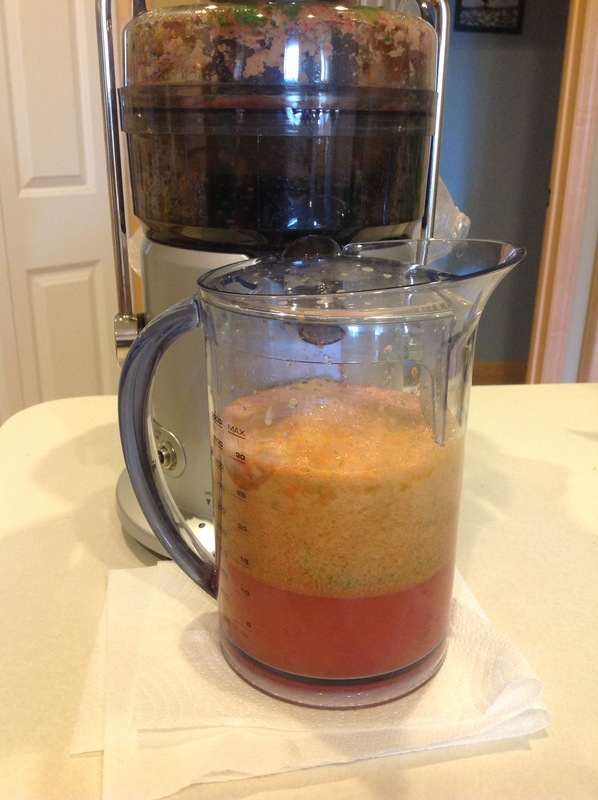 I do think the grapefruit over powered the juice just a tad. I would add oranges or an apple versus grapefruit. 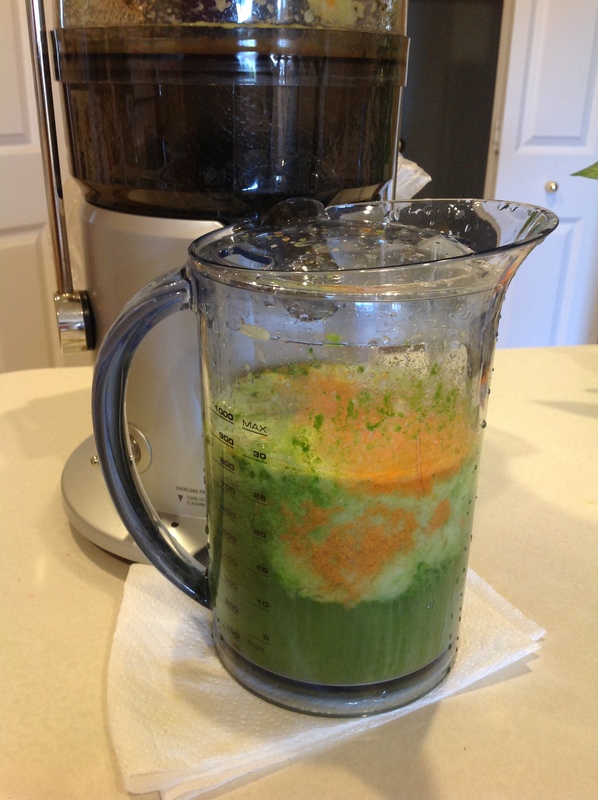 Over the weekend we had went to see my sister and brother-in-law’s house and she was the one that said I should try juicing. 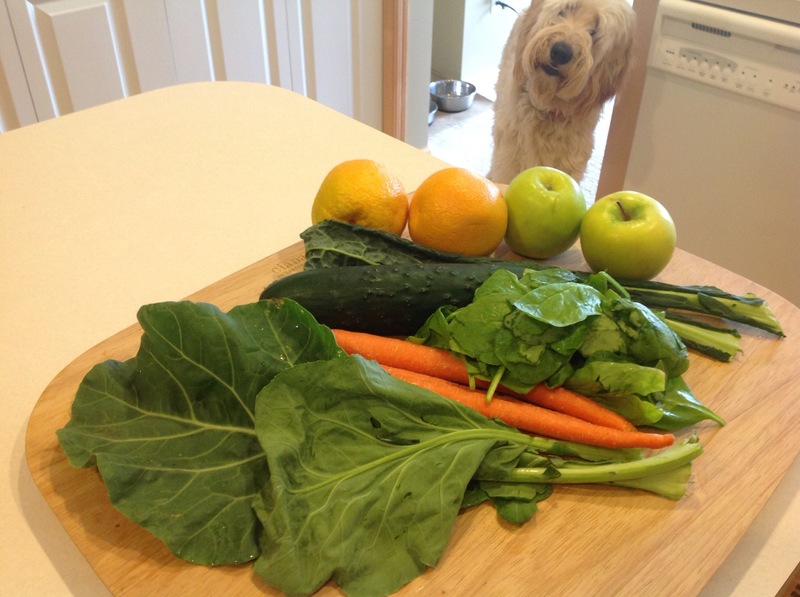 I decided I should bring a juice for them to try. I am already at Juice #30, doesn’t feel like we have juiced that much already. 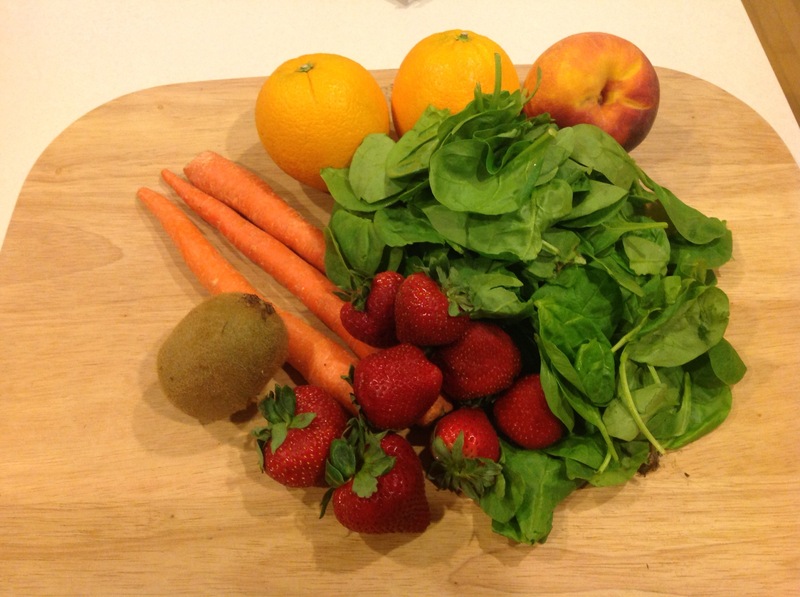 We have been juicing just about 6 weeks and we juice breakfast-lunch/snack, Monday thru Friday. Sometimes we juiced on the weekends here and there. I thought this drink tasted ok as it was pretty leafy tasting. My sister and her husband liked it and said that it tasted sweet. 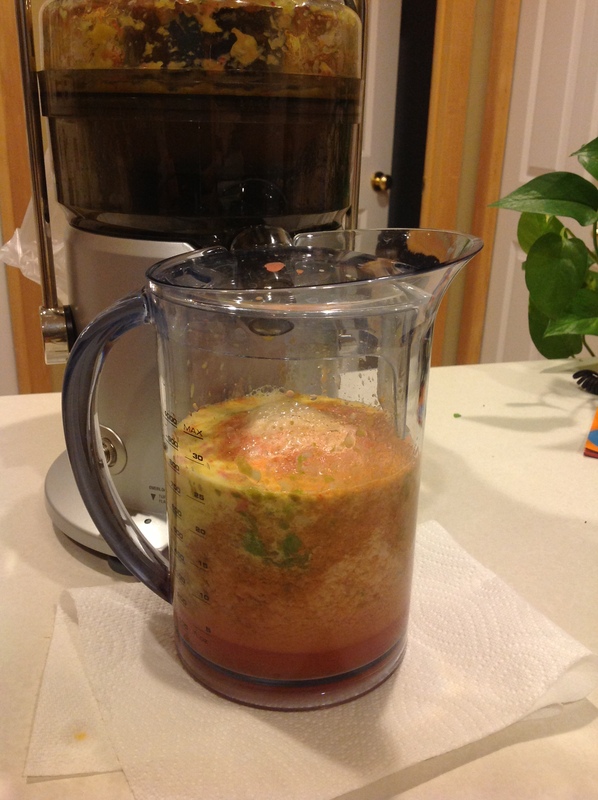 Finished Juice. I am finding myself liking the peach taste in a morning drink. I did want to use up my grapefruit so I added that. But I like the peach taste. Have a great weekend where ever you may be!